#2 – How will I track my results? If you’re going to put the time and money into a new website, you want to know that it’s working. In order to effectively gauge your results, you must understand the key indicators that make a website successful. After all, you can’t improve what you can’t measure. With many traditional advertising mediums, it’s impossible to know what is working and what’s not working. In the digital marketing world, this glaring problem can be easily overcome. The online engagement of website visitors can be tracked to excruciating detail. 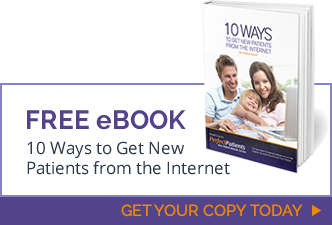 You know where your prospective patients are coming from, and whether they’re actually turning into real patients. Google Analytics – Just add a snippet of code to the back-end of your website, and you can track the engagement of your website visitors. You’ll have access to vital metrics like which pages visitors are landing on and how long they’re spending on each page. Heat Mapping – Giving you an x-ray view of online behavior, heat maps allow you to see exactly what people are doing on your website. You’ll see where people are clicking, where they’re coming from, and where they’re scrolling to. New Patient Tracker – While other analytic tools provide more surface-level statistics, the Perfect Patients New Patient Tracker reveals the specific behaviors of visitors that ultimately become patients. This powerful tool can be used to improve your website’s ability to convert visitors into patients.